Most of the time, the quality of our life is determined by the quality of our activities. From smiling to walking, movements are carried out with the help of the specific group of muscles, tendons, ligaments, bones and joints. These organs together form loco motor system. Usually pain and/ or limitation of the movement are the first and most common symptoms of the imbalance of this system, which can affect movements immediately or later depending upon the cause. Even a slight pain with loco motor system can affect the quality of life. And when the pain and limitation of the movement are chronic and intense life becomes a misery. Ayurveda is helpful with many health issues and diseases of the loco motor system. Ayurveda can also advise you regarding the lifestyle that can improve your joint and muscle health. 1. Improper use: All of the organs of loco motor system are designed to move. If we are not using them properly, it can result into inflammation, wasting and degenerations producing various symptoms. Incorrect posture, over use of certain movements without proper rest (related to work, household chores or exercise), overextension or moving the joint in wrong directions, fixed posture for a long time (like when we are using the computer), etc. 2. Infections: Like arthritis, gout, SLE, osteomyelitis, etc. 3. Deficiency: Especially of iron, calcium, Vitamin D, etc. 4. Metabolic disorders: Especially sodium/ potassium levels, hormone imbalance, etc. 5. Damage/diseases of nerves: will affect the functioning of the muscles, tendons and ligaments, and there by the movements involved. Sometimes damage to a joint could be the reason for damage of the nerves affecting a group of muscles and associated tendons and/ligaments. Eg: Inter vertebral disc prolapse damages spinal nerves leading to problems with arms or legs. Many people know that the balance of doshas is important for health. Saying that, imbalance of vata has a crucial role in the health of loco motor system. Vata imbalance can lead to poor absorption of nutrients leading to deficiencies and affecting overall health specifically of loco motor system. Also when vata is imbalanced, our body generally becomes dry and muscles and joints become stiff. Then they can be inflamed even on normal use and damaged on a little stretch. Also nerves can become irritated/ unnecessarily stimulated resulting into tingling sensation, numbness, loss of sensation, etc. Immunity can also be compromised and we get prone to infections. 6. Low back pain including lumbago, lumbar spondylitis, scoliosis, etc. 1. 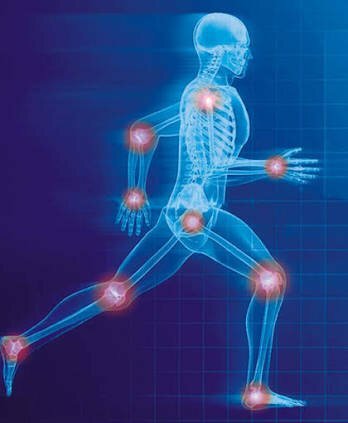 Herbal combinations: Ayurveda offers a range of wonderful herbal combinations for joints, muscles and associated structure. In India, people prefer Ayurveda over other systems of medicine when it comes to these issues. 3. Detox treatments: Helps to address the root cause and get back to balance. 1. Daily exercise: Type, duration and intensity should be determined by your body type, age, health issues and profession. Remember to exercise within your limits. Choose exercise according to your profession so that exercise compensates and supports the system. 2. Oil massage: Helps to balance vata and lubricate the tissues. It is an excellent way to combat the wear and tear of daily use. A simple self massage can help to achieve a lot! 3. Nourishing diet: make sure you add healthy fat, and required nutrients (through different vegetables, proteins and nuts) to your food. 4. Sunlight: Make sure you are exposed to sunlight, preferably around sunrise and sunset. 6. Good posture: In order to avoid damage to loco motor system it is important to maintain a healthy posture while standing, walking, sitting and sleeping (choose your bed and office chair wisely). Dr Rafeena provides consultations and treatments for the above health issues and diseases..